Oooohhhhh I just had the yummiest stir fry! Megan (runners kitchen) please tell your friend Jesse "thank you" for inspiring this dish! 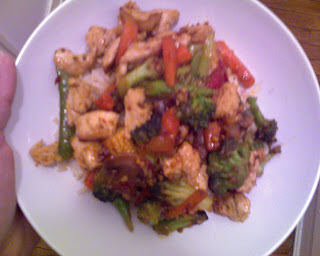 I finally made a stirfry that I found delish! I stir fried the chicken and veggies (TJ's Harvest Hodgepodge) in oil, garlic, and chili bean sauce then added Mikee's Sesame Teriyaki Sauce and it was just amazing! I served it over brown rice. 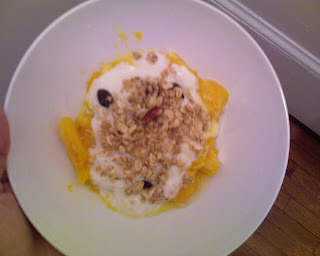 For dessert I had an orange cooked in licbinb and splenda, topped with Dannon ff activia and Kashi granola. Oh wow, that looks delicious!!!! Hope you have a good night! I love stirfries! Have a good night! Glad you liked the stirfry! I told Jesse that he should start his own blog, he's a great cook!